Apples of Gold Jewelry has created a new design that will sweep you off your feet with this engraved heart red garnet engagement ring. Available in 14K yellow gold, the band has a series of small, etched hearts going around the ring, giving it a little extra flair and romance! 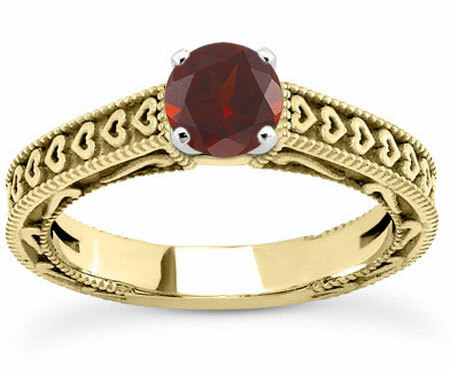 The round cut, crimson garnet stone, which is AA rated and 6.5mm in size, will make your heart flutter when combined with the hearts on the ring and the yellow gold, creating a new and romantic engagement ring design that you won't be able to refuse! We guarantee our Engraved Heart Red Garnet Engagement Ring, 14K Yellow Gold to be high quality, authentic jewelry, as described above.